Note: You are purchasing a standalone product. MyMathLab does not come packaged with this content. If you would like to purchase both the physical text and MyMathLab, search for ISBN-10: 0321935446 /ISBN-13: 9780321935441. That package includes ISBN-10: 0321431308/ISBN-13: 9780321431301, ISBN-10: 0321654064/ISBN-13: 9780321654069 and ISBN-10: 0321931076/ ISBN-13: 9780321931078. MyMathLab is not a self-paced technology and should only be purchased when required by an instructor. 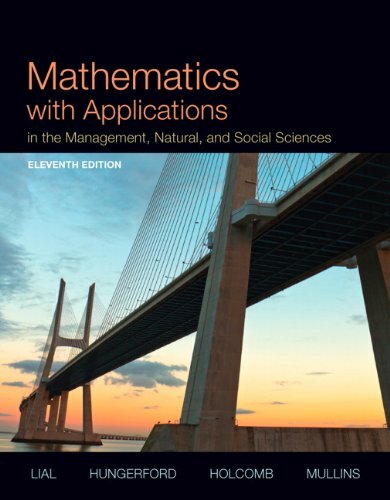 Mathematics with Applications in the Management, Natural, and Social Sciences presents sound mathematics in an understandable manner, proceeding from the familiar to new material and from concrete examples to general rules and formulas. The Eleventh Edition retains its focus on real-world problem solving, but has been refreshed with revised and added content, updated and new applications, fine-tuned and newly-integrated pedagogical devices, and enhanced exercise sets.